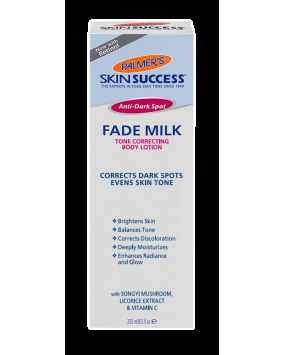 Palmer's® Skin Success® Anti-Dark Spot Fade Milk is a tone correcting body lotion that targets pigment-prone areas such as knees, elbows, feet and décolletage to help correct unwanted discoloration. Formulated with a powerful pigment-perfecting blend of ingredients: 5% Niacinamide, Retinol, Songyi Mushroom, Vitamin C, Licorice Root Extract, and Vitamin E. Especially effective on problem areas such as knees, elbows, feet and décolletage. Free of Parabens, Phthalates and synthetic dyes. 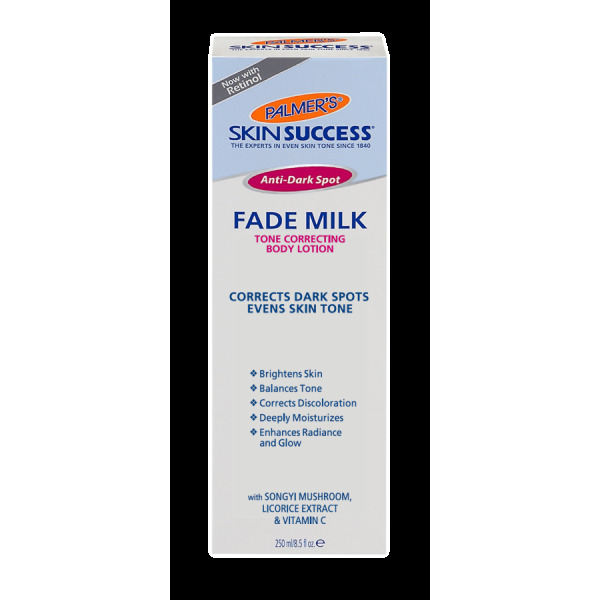 Apply Palmer's® Skin Success® Anti-Dark Spot Fade Milk twice daily on clean, dry skin focusing on more pigment-prone areas such as elbows, knees and décolletage.